✅ The list updates over time! Soon we will be adding more news, options and surprises, so stay tuned as many news come to the APP. 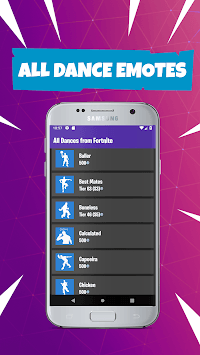 If you enjoy Battle Royale, you will surely enjoy this App in which you will find all the dances you know. 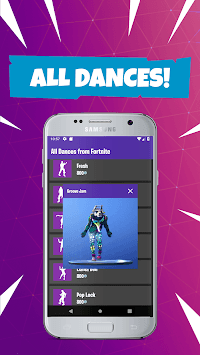 Also, in the videos there are many Skins doing the different moves, choose the one you like the most! What are Battle Royale Dances? 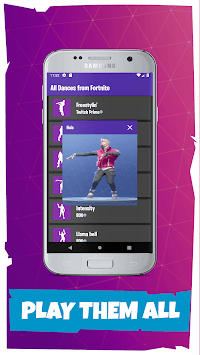 One of the best ways to differentiate yourself from the entire legion of Battle Royale players is to select your Dances correctly. You can get them by raising battle pass levels or through the Battle Royale shop, where there is a wide variety to choose from to give the game your own style. Whether it's after a win or just for fun, you can use these moves to rub them in your opponent's face. Without a doubt, the best emotes are those that are best known by everyone, such as Make It Rain or, another one also well known for appearing on a series of tv: Fresh. Whatever you are, you have a lot of dances to choose from and we are convinced that there are a few that will fit perfectly with your style. Below we leave you the list of our favorite dances, make yours and leave it in the comments!!! In future updates we will inform you through notifications of new updates from developers so you can hurry and access the Battle Royale store and buy before anyone else the new emotes and be the envy of your squad team. Here you can find all that Battle Royale has described as epic. They are characterized by being the rarest moves launched to date (at the moment there are still no legendary). They are more expensive than the rare and uncommon emotes and tend to have a better visual appearance than the rest. Here you can find all the emotes that are considered less special than the epics, but more than the uncommon ones. These are the moves that are considered less special than the epicos and rare, but more than the common ones, as well as the loot or the different accessories that you can find in Battle Royale, these are also accompanied by the characteristic green color.